Israeli dancing is a unique Israeli creation, a kind of new folklore with special elements. The Israeli dancing repertoire includes approx 4,000 dances created over the last 30 years. It is estimated that the 'crazy' and addicted amongst Israeli dancers know all the steps to about 400 dances! Usually a dance is created in response to a well-known song, often from the Israeli charts. Because Israel is made up of so many cultures, the music contains an amazing variation of moods, melodies, rhythms and forms - and the dances contain a corresponding variation in style... from Latin salsa to waltz and polka; from hip-hop to rock'n'roll; from Irish to Yemenite styles. Israeli dancing is a combination of circle, couple and line dances - always dancing in a closeness with others which is friendly, fun and exciting. As well as dancing, a regular dance class (Harkada) creates opportunities for lots of socialising - friendship, coffee and a good chat. Participating regularly in a Harkada is healthy for both body and mind. Israeli dancing is also a good way of keeping fit. A weekly Harkada (which typically lasts 3 to 4 hours and includes about 50 dances) combines high impact activity with slower, more controlled movement. This contributes not only to one's fitness level but also to one's mental and emotional well-being - much more fun than the gym! Israeli dancing weekly Harkadot are run in many countries, cities and towns around the world - all over Europe, the Americas and as far as Australia and Japan. Apart from weekly Harkada there are also many dance weekends, dance camps (ranging from 3 to 5 days) and dance marathons (all-night dancing). These are organized around the globe throughout the year, featuring choreographers from Israel, participating and teaching new dances. Find out more about dates and locations of classes and workshops on our events page. You can read more about Israeli Dancing in this interesting and informative article from The Washington Post of July 2005. Our Harkada is organized by a group of experienced dancers who decided to create something a bit different - a strong dance community which aims to include the younger generation and a wider audience. 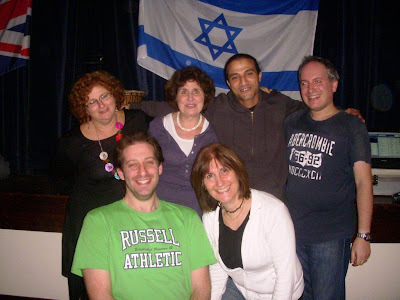 As our name implies, Strictly Israeli Dancing is about good dancing in a friendly atmosphere. We are proud to say that we regularly hear very positive responses from our dancers, about feeling welcome in our classes and about the high energy on the dance floor. The fact that this Harkada is run by a group is unusual - generally a Harkada is directed and organised by one person who plays the music and does most of the teaching. Our class is open to anyone who wishes to become part of our community. We regularly have guest teachers and are always happy to consider more people for our regular teaching rota. Click on these links to see what the press has to say about our class - articles in dailyjews.com - UK Jewish news - and in ynetnews.com - English version of Ynet, website of Yedioth Ahronoth, daily Israeli newspaper. Also have a look at this article about our class from Jewish Renaissance magazine. Don't worry! Come early (8pm prompt) and we'll teach you the basic steps and some easy dances. Wear trainers/dance shoes and comfortable casual clothes. Come regularly and you'll build up your repertoire within a few weeks. See our Starters! page for more information. Always feel free to contact us with queries.